SNMP traps will be sent if you specify global SNMP settings in Veeam Backup & Replication and configure software on recipient's machine to receive SNMP traps. For more information, see Specifying SNMP Settings. Select the Send email notifications to the following recipients check box if you want to receive notifications about the job completion status by email. In the field below, specify recipient’s email address. You can enter several addresses separated by a semicolon. In the Subject field, specify a notification subject. You can use the following variables in the subject: %Time% (completion time), %JobName%, %JobResult%, %VmCount% (number of VMs in the job) and %Issues% (number of VMs in the job that have finished with the Warning or Failed status). 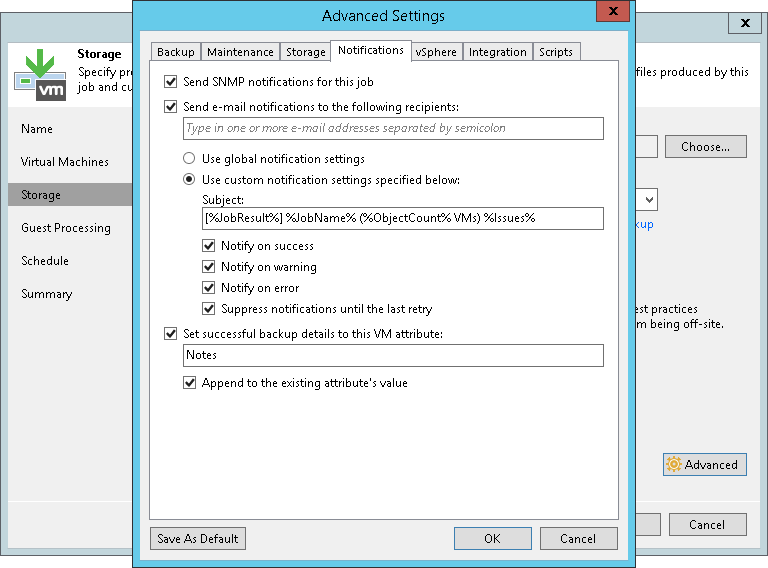 Select the Set successful backup details to this VM attribute check box to write information about successfully performed backup and backup results (backup date and time, backup server name and path to the backup file) to a VM attribute. In the field below, enter a name of the attribute. If the specified attribute does not exist, Veeam Backup & Replication will create it. Select the Append to the existing attribute's value check box to append information about successfully performed backup to an existing value of the attribute. In this case, Veeam Backup & Replication will keep values added by the user in the attribute, and will overwrite only the value added by the backup job. If you do not select this option, Veeam Backup & Replication will overwrite the existing attribute values (made both by the user and backup job).